Vending machines can be used to sell everything from beverages to condoms and one Southern California believes their technology could mean fewer lines and more business for recreational marijuana shops. 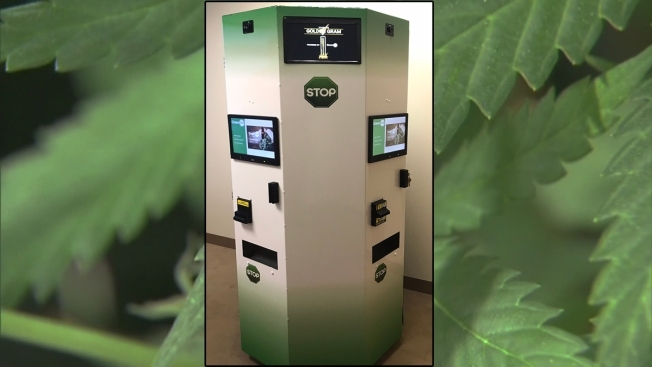 GreenSTOP has developed what it's labeled as the first four-person kiosk designed specifically for marijuana dispensaries. Other companies have developed a vending machine using the same technology as those found in a workplace lunchroom but GreenSTOP, run by two men with strong ties to San Diego, is looking at breaking the mold when it comes to how many customers can be served in a neighborhood dispensary. San Diego native James Edwards, who attended Mission Bay High School, has partnered with former San Diego State University student Tim Island to launch the Manhattan Beach-based company. He said an average marijuana dispensary will have five to six employees or “budtenders” who answer questions from customers. However, an issue arises when the time comes to pay. “They have bottlenecking,” he explained, meaning multiple customers are in line waiting for one register. The GreenSTOP technology will create a kiosk that is self-serve and allows multiple users to shop, select and buy from the dispensary’s stash. It can even incorporate reviews of the products from credible sources. The current business model is to rent the kiosks to dispensaries and take a percentage of sales. Edwards and Island said they have a large interest list but they’re discussing the company’s potential with investors and their legal team before entering into contracts. The plan is to launch in Los Angeles by the end of 2018 with the potential of kiosks in San Diego County in 2019, Edwards said. The kiosks are not affiliated with any dispensaries in San Diego County under the same name.